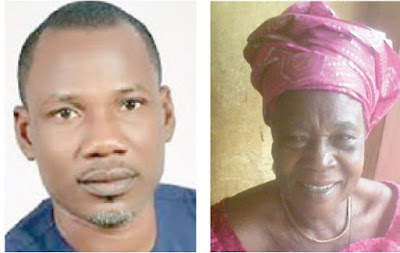 Many people were shocked following the result of the Nnewi North Constituency of Anambra state in the just concluded State House of Assembly election held on March 9, 2019, as the son of akara (bean cake) vendor, Nonso Okafor, fondly called Smart who contested under the platform of APGA, trounced Obinna Ngonadi, son of Chief Humphrey Ngonadi, a multi-millionaire industrialist to emerge winner of the election. Recall that the people of the area had on February 23, voted massively for one of their own, oil and gas mogul, Dr. Patrick Ifeanyi Ubah on the platform of YPP, to become senator of Anambra South. 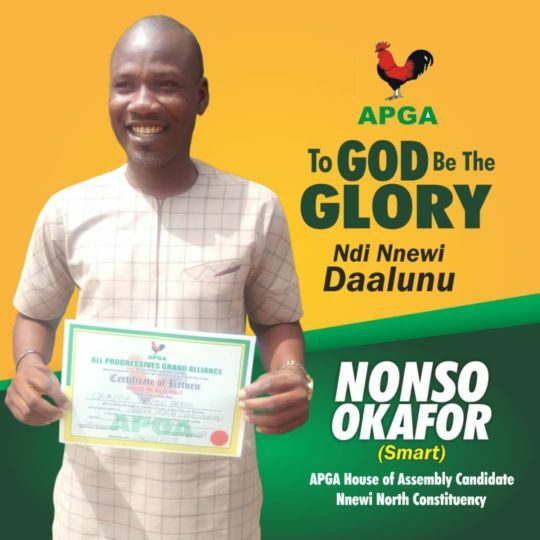 Curiously, all the money and influence of other big shots in the area who rallied round the Ngonadis, could not save them from the giant killer called Nonso, who could barely fund his campaign. Mother of the winner, Mrs Monica Okafor, a widow and an akara seller since 1999 when she lost her husband and began to fend for herself and their four children; two males and two females, said she was short of words to express what God had done for the family. Radiating with smiles in the course of this interview, she said her heart was full of joy when she heard that her son won the election. Of course, before Nonso went in for the contest she said she called him to tell him that the battle would not be a child’s play. But he left her with the assurance that he would win the election; just like the case of David and Goliath in the Bible. “I thank God who made this possible; that God who lifts up the poor from a refuse dump, I thank Him. God knows all we have suffered in this life and has decided to wipe our tears, I thank Him,” she said. Although the last born of the family, Nonso’s mother said that he showed very early in life that he would go places. According to her, his character disposition as he was growing up gave her an indication that he would be something else as he talked and reasoned like adults even as a small boy. “I saw in him rare qualities and he has a different character disposition. Sometimes when he talks, I become shocked because he would exhibit wisdom that could not come from many adults. When my mother-in-law was still alive, I called her one day to tell her that this boy might be Ogbanje (one of the gods in Igbo ancient his- tory believed to have the capability to influence human actions). But she said it was not true, and only told me that the boy is a special creature who would in due course show what he is created for. And I did not stop there. I consulted one Rev Father Odunukwe at Nnobi where I went for prayers, he told me that I should not panic, that God brought Nonso into the family to be a great man,” she narrated. Mrs Okafor said the significance of Nonso’s victory in the State Assembly poll was to show that it is only God that crowns whoever He chooses and that money is deemphasised when it comes to God’s intervention.